These Panels are mainly used on Special Projects that require a panel that can be made out of a heavier gauge material and that require a very unique appearance. Some of these Panels can be used in either a Horizontal or Vertical application. A wide variety of the Panels come in Multiple Gauges (18 thru 26), Paint Finishes or Textures. If you have a project that requires Curving, Mitered Corners, Perforation (High Sound Absorption) or any other Industrial applications, these are the panels for the job. Please contact us for help in determining which Profile, and Application that may be best for your project. Please inquire for other Panel Profiles/Width's, UI.90/FM Data, Special Applications, Embossing, Special Gauge availability, Special Colors or Finishes. 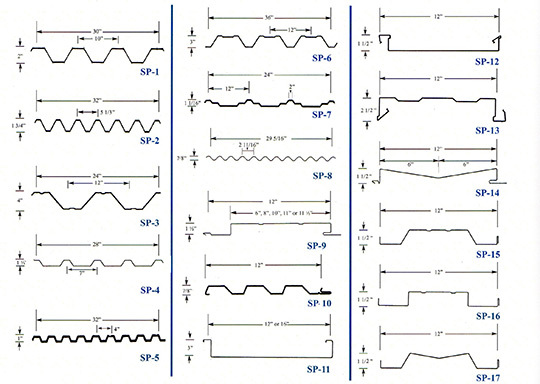 Some profiles may require minimum quantities and longer lead-times for certain panel options. Panel Embossing will help to minimize oil canning. Oil canning is not a cause for panel rejection. Certain Panels can have factory applied mastic. Please inquire. Panels â€” SP-9 thru SP-16 are not recommended for Roof applications. Panels â€” SP-13, 15, 16 & SP-17 require a Button Punch Tool to securely fasten the panels together. Panels SP-11 & SP-12 are mainly used on Canopies. 10. Panel SP-10 is also available with other Rib Options. Please inquire.